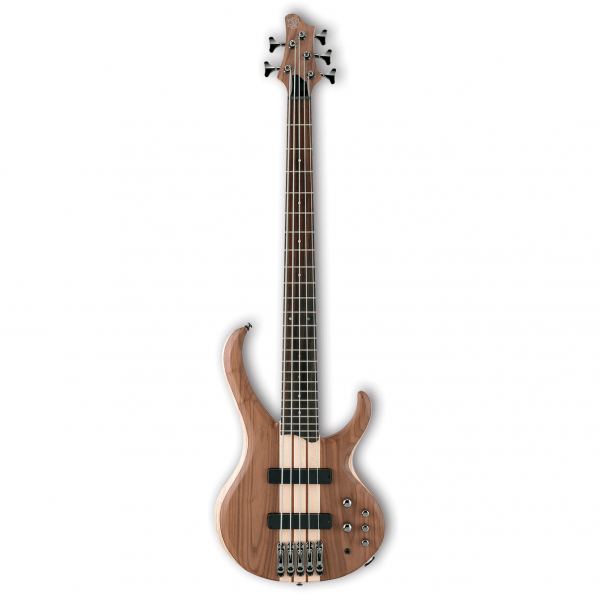 Ibanez has created a bass with boutique styling and appointments at a price the working musician can afford. The Ibanez BTB675 electric bass incorporates premium bass tonewoods with electronics, and hardware that will make you a believer. A 35″ scale length gives you solid bass tones and articulation, while the deep cutaway gives you unencumbered access to the upper fretboard. Neck-through construction and a multi-piece neck offer great playability, and Bartolini pickups let you craft a great low-end sound. Necks aren't just part of a bass, they are the heart of the bass. The neck feel and playability can make or break an otherwise great instrument. The Ibanez BTB675 incorporates a 5-piece maple/bubinga neck that offers you killer stability, playability, and tone. Ibanez basses have long been known for their excellent necks. Not satisfied to just attach the neck to the BTB675, Ibanez utilized neck-through construction, which gives you better vibrational and tonal transfer through out the entire instrument. A light ash body with walnut top and rosewood fretboard complete the picture making the Ibanez BTB675 a bass player's dream. A slightly longer 35" scale gives the BTB675 superior articulation and helps provide more tension and a better feel on the 5th string. Formerly found on boutique basses only, this extended scale length will provide you with a better playing experience on lower strings. The unique Mono-Rail II bridge is used on the BTB675 giving you the best string separation possible. Each string has its own separate mini-bridge, this keeps strings from interfering with each other's vibrations as with traditional bridges. Ibanez BTB675 basses come out of the factory with Bartolini pickups and preamps installed. Humbucking Bartolini BH1 pickups use ceramic magnets to give you a warm tone with superior dynamics. A 3-band EQ lets you dial in the perfect sound you have been looking for. It doesn't matter what style of music you play, the Ibanez BTB675 is ready for the gig.